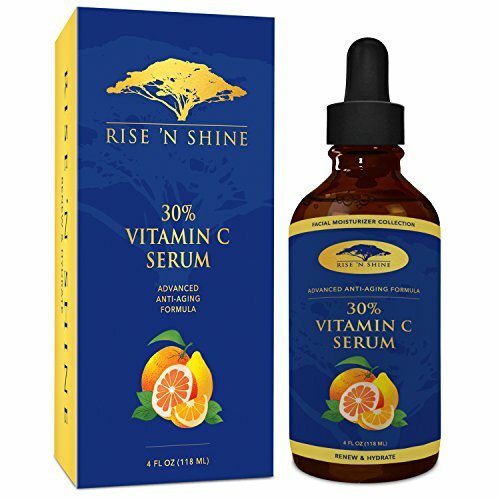 HIGH QUALITY, HIGH POTENCY VITAMIN C SERUM: Our Vitamin C Serum contains a potency of 30% L-Ascorbic Acid Vitamin C mixed with Hyaluronic Acid for a highly effective recipe. The consistency is not watery and makes for easy application. Topical vitamin C is 20 times more effective than taking it orally to replenish your skin's vitamin C levels that naturally decline over time. BONUS EBOOK - Included with every purchase, you will receive an Ebook that teaches you about the uses and benefits of your new product! Every Rise 'N Shine Online product comes with a 30-Day Money Back Guarantee. So click the Add to Cart button now and order your own Vitamin C Serum today! If you have any questions about this product by Rise 'N Shine Online, contact us by completing and submitting the form below. If you are looking for a specif part number, please include it with your message. Purest Hyaluronic Acid Powder, For Making Anti-Aging Serum, Supporting Internal Hydration & Joint Health, 30 Grams. Non-Irradiated, Non-Contaminated and Non-GMO. Vegan Friendly.